Are you putting your house on the market? It is obvious that you hope to sell your home quickly and get your asking price when. Get ready for success with these 7 exterior home staging tips to get the results you want. Water damage, pest infestation, and mold can happen if you leave the repairs undone. All of these will be revealed during a home inspection and could devalue your home. This exterior home staging tip can really enhance your home’s curb appeal. Your home’s exterior tends to accumulate a lot of dust, grime, and sometimes mildew over the years. Pressure washing the siding, concrete, vinyl fences, decking and any other surfaces that have lost their shine over time will make the exterior look like new. You will need to be careful with this exterior home staging tip because a pressure washer can be powerful enough to remove paint. You need to remove any dead plants and cut back the shrubs. 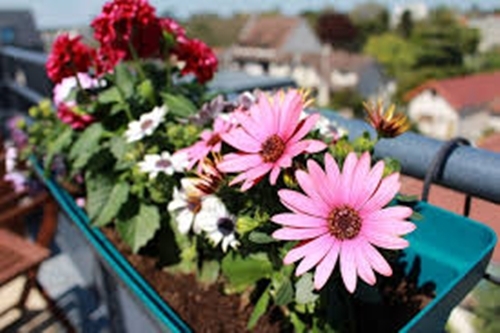 Try adding some colorful flowers or plants with varying heights and mulch to the flowerbeds. Check that the flowerbeds frame out the exterior of the house so they become an extension of it. You can welcome the buyers with colorful flowers by the front door to add some life to this hardscape. Have matching planters on either side of the door. Is there not enough space on your porch? You can use one larger planter and two smaller planters in a corner to create a similar statement. These are easy to install and cost-effective. They also make the area around your door stand out instantly. The important part of the exterior home staging tip is to make sure all the hardware is the same material. This is the last step to dressing up your house’s exterior. Add accessories, a seasonal wreath, a new doormat, or a seating area, around your front door. It will invite buyers into your home. You should also accessorize other areas in your yard. It may impress buyers. Try updating an outdoor living or dining area. You can do that easily with new throw pillows, cushions or a rug. Add more light to define and enhance the space. A fireplace could give buyers the idea that they may enjoy this area under the stars, even on cool nights. If you’d like more exterior home staging tips, give us a call. We’d love to help you sell your home quickly and for the most money.